Passive mobs will never attack the player. Other than squids, all passive animals spawn on initial chunk generation, and will not despawn or respawn. Farm animals such as chickens, cows, pigs, sheep and horses can be tamed and bred. Deer and pheasants are wild animals that cannot be bred or tamed. Squids need salt water to spawn in, and are the only passive mob that will despawn and respawn after the initial world generation. Neutral mobs will not attack the player unless provoked. The act of provoking neutral mobs varies. Note that spiders will spawn hostile due to the fact they spawn in light levels of 7 or below, but are actually neutral mobs, as they are passive unless hit in light levels of 12 or above. These mobs can be tamed by the player, and in the horse's case, ridden as well. Hostile mobs will attack the player when in range, each with their own abilities. Zombies, Creepers, Skeletons, Spiders, and Javelin Skeletons require a light level of 7 or less, and for there to be no Spawn Protection in the area to naturally spawn, and will either burn to death in the sunlight, or can possibly despawn on their own. Bears spawn on initial chunk generation, and will not despawn or respawn. Spiders will become neutral at light levels 12 and higher, but they do not spawn neutral. 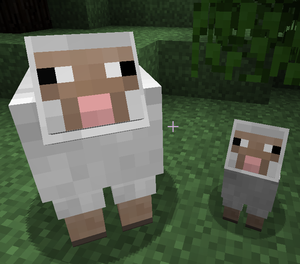 Tamable and passive mobs (excluding squid) have different genders (male or female), which is determined randomly at the time that the animals spawns. Other than horses and wolves, these animals have visual cues to easily determine the gender such as antlers, horns, tusks, udders and different feather colors. For mobs that do not have visual cues, the animal can be right-clicked on for a chat message stating the gender. Each animal has a size modifier that determines how big it is. The size of an animal is inheritable, and determines how much meat and the size of the hide that is dropped on death. Other genetic traits that are currently in the code, but not fully implemented include: strength, aggression, obedience, color, climate and hard. It is currently unknown what is planned for the use of these trait modifiers. The size of a baby animal's head is reduced, but still larger for it's body size. Some baby animals also have a different texture than their adult versions, such as chickens and deer. As the baby grows up it will slowly change to the adult texture and grow its gender visual cues such as tusks, horns and antlers. Animals also have a hunger bar, which slowly depletes over time. Animals will attempt to hunt or eat grass to replenish their hunger. At roughly 90% hunger, they will begin to heal slowly if they have taken any damage. Carnivores such as bears and wolves will eat meats off the ground if they are left within a certain range, or they will kill the passive animals nearby. Hunger currently has no negative effect on animals other than the lack of health regeneration. An empty hunger bar currently will not result in the animal taking damage or eventually starving to death. The general technique for combat against hostile mobs is relatively the same as for their Vanilla Counterparts, with the key difference being the implementation of Damage Types. Each mob deals a specific type of damage when hurting the player, and is strong or weak to specific damage types as well. This is important for deciding what type of armor to wear as well as which weapon to use when entering combat. Almost all mob behavior is currently implemented through the use of different vanilla AI systems. For example: when a passive mob has been attacked, it uses the vanilla ocelot AI to run away from the attacking entity. Female chickens also use the "sit on chest" ocelot AI in order to find nest boxes to roost in. Most of TFC's custom mobs borrow their sounds from their vanilla relatives. Bears sound like wolves, and pheasants sound like chickens. It is planned to eventually move all "magical" mobs underground by limiting their spawn ability to only be below sea-level. The creatures will still be able to be found in caves, but the surface will instead be populated with more believable hostile mobs. Hostile mobs do not understand how to path around stalactites and stalagmites, and will often get stuck next to them after walking too close. This comes in handy when exploring caves and engaging in combat. There is currently placeholder code for a non-implemented achievement titled "Steve Irwin" which would be triggered by poking a creeper with a stick. This page was last modified on 11 July 2014, at 00:35.